JF Engineering Products LLP manufacturer & exporter of Flanges availbale in various forms and size, standards like ASME B16.5 flanges, ASME B16.47 Flanges and ASME B16.36 flanges.These all standards availble in all type of flanges like Weld Neck Flanges, Blind Flanges, Spectacle Blind flanges, Slip on flanges, Orifice flanges and Threaded Flanges etc. We have specialization to manufacture customized Flange per customers’ specifications, we welcome small quantity order. JF Engineering Products LLP is Manufacturer, Stockists & Supplier of premium quality range of Orifice Flanges, Stainless Steel Flanges & Other Stainless Steel Pipe fittings that are manufactured under the expert guidance of our diligent workforce. we are highly experienced company in Orifice Flanges & other pipe fittings. Our Orifice Flanges & Other Fitting products are manufactured using quality material and go through a rigorous quality check at all stages of production to ensure quality. Dimensions are in millimeters, except for bolts and bolt holes. Height of Raised Face (RF) in CLASS 600 is 2 mm at NPS 1 - NPS 3, and 7 mm at NPS 4 - NPS 24. 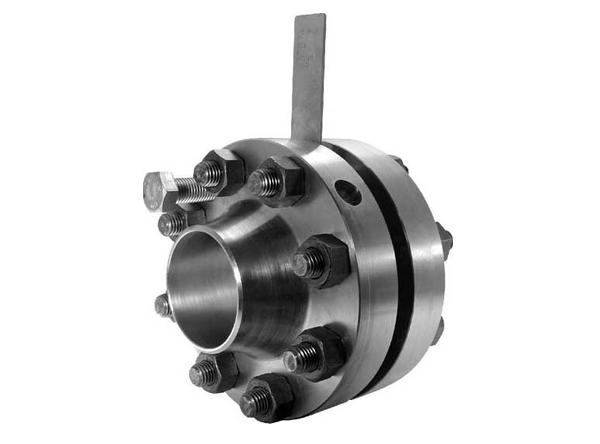 Weld neck flanges NPS 3 and smaller are identical to Class 300 flanges except for bolting and may be used for such service. All other dimensions are in accordance with ASME B16.5. 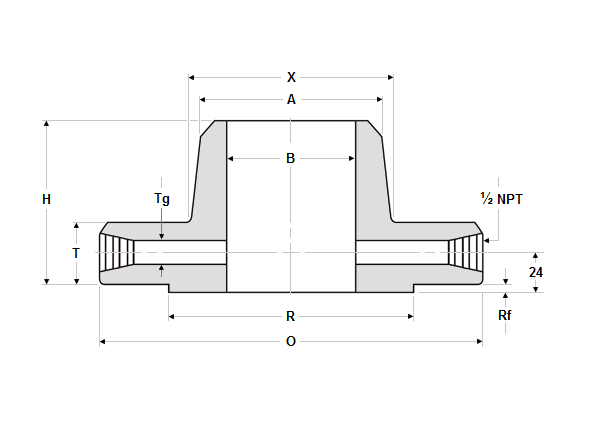 Ring joint flange in NPS 24 will require an angular meter tap. Other NPT sizes may be furnished if required. Bolt lengths for raised face flanges include allowance for orifice and gasket thickness of 6 mm (0.25 in.) for NPS 1 to NPS 12. Bolt lengths for ring-type joint flanges include allowance of 15 mm (0.62 in.) for NPS 1 to NPS 3. Bore (B) is to be specified by the purchaser. The length of the Stud Bolt does not include the height of the chamfers (points). Products are packaged to ensure that there is no damage during transit. In case of exports, standard export packaging is done in wooden cases. All flanges are marked with Grade, Lot No, Size, Degree and our trade mark. On special requests we can also, make custom marking on our products. Orders will be sent out within 2-3 business days, and may take up to 5-10 business days in transit. If Flange is out of stock, orders may take up to 2-4 weeks to ship. JF Engineering Products LLP will notify buyer if this situation occurs..